Please welcome Ales Kot, a writer hailing from the igloos [or was it bear caverns?] of the Czech Republic and now residing in Angel City, USA. 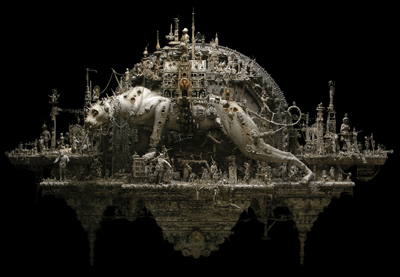 In early fall, agent Kot conducted an interview with apocalyptic sculptor Kris Kuksi. This interview was initially meant for Issue 04, but we’ve decided to publish it here instead, in order to give more print real estate to Kris’ incredible work. COILHOUSE: Your website biography opens with a Lord Byron’s quote: ”When falls the Coliseum, Rome shall fall; And when Rome falls – the world”. What’s your opinion on the current mass fascination with various visions of the apocalypse? KRIS KUKSI: Mainly because we’re at a tipping point in humanity and I really wonder if we’re going to figure out how to save ourselves from such things as climate change, religious fanaticism, peak oil, and overpopulation. There is much to be learned from history – there are always cycles of growth, prosperity, decline and fall. Right now we have advanced more than ever before and yet we may be beginning to see indication of decline. There certainly is resistance to confronting it with how humanity has set up governments and education. There is a maze of laws and legislations to navigate in order to change things in the world. I believe there is always a dodging of responsibility when it comes down to saving this planet. Rome fell for many reasons and one of those reasons was its involvement in the Middle East, its attempt to conquer and colonize it, with subsequent economic deterioration as a result. Thereafter, barbaric invaders and the rise of religious changes further contributed towards the fall. Do we see parallels in history today? I think it’s obvious. In the past, you’ve stated that humanity is a “silly, ongoing, short-term memory machine that fails to learn from the past”. What are your thoughts on ways to change this? Can the machine be repaired, and if so, how can it be done? It certainly can and the word of the day is “choice”. We have all the power in our hands, minds, and might to educate and and learn and remember what history tells us. There is a decline in education in the industrial world because man has to answer to the machine before inquiry. We have based our lives on serving these machines of industry and forget to observe the results, which are those things that harm life on the planet in many ways. You’ve said that you believe time becomes blended together as history repeats itself – how do you perceive time? Time is an elastic thing – both long and short and only relative to perspective. I like to think that humans move very fast on this planet in comparison to the age of the earth. All the rocks and trees are watching us run around and build things, watching them tumble and us building new things and so on. We are all like little cells in one large organism constantly changing and reproducing and dying and so on and so on. I’m not so sure time does exist because we never get from one end to the other, things are always moving and coming back to a molecular origin again and again. If time is anything, it is a continual cycle, but perhaps I’m getting into some thoughts outside my profession now. What do you think is the true nature of this world and how can a person get closer to it? We are naked beings and nothing has any meaning. We only fabricate things to help us be more removed from nature. Humans are like the prodigal sons of Earth – moving away from their mother to spend her fortunes, only to return in death as the stripped down and barbaric beings we once were. So to get closer to true nature? Burn your clothes and belongings and money, have a sharp chiseled stone to catch food and a grass hut to keep shelter! Or realize we live a world that is consumed by false beliefs and agreements and try to live your life without taking it all too seriously. What’s your fondest memory of art changing you? I don’t recall a profound moment but I did enjoy looking through books at a young age, seeing classical art and really being moved by it. My grandmother was very intelligent, she was able to show me the world through a few small books and always provided me with pencil and paper to draw. But art really changed my life when I first went to Europe when I was in my early twenties. I knew I always wanted to be an artist but I was deeply inspired by the great art collections of Europe. 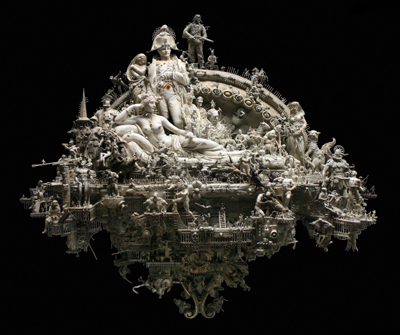 Has any specific sculpture of yours had an especially profound impact on your life? That is a touchy one, but I would say that Afterworld Transporter was produced shortly after my mother’s death in April 2008. 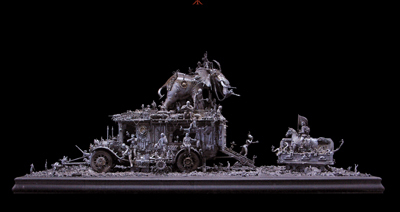 That piece is an old style hearse with lots of animal and human forms covering it, as well as a coffin on tank tracks approaching a ramp up into the back. I was able to translate my sorrow and loss into something humorous and fun. Also, Imminent Utopia was the most involved and emotionally driven piece I’ve ever created, and is now in the hands of a great art collector. How do you think Earth will look 25 years from now? What visions do you fear, if any, and what visions do you hope will become true? Oh my, well perhaps two alternatives. One: We didn’t see the signs of what was to come and we just sank into human demise and ecological disaster. I would like to think that a few humans got out and made a nice life in Madagascar, but left the rest of the world to starve to and succumb to disease and pollution. Two: We actually did get our governments to stop fooling around and put our minds together to learn from our mistakes and correct what we’ve done wrong. But I think in the final assessment it will be overpopulation that was be the biggest problem. Oil reserves will run out someday and that is doom to so many people who depend on it, but as long as we humans can still get our quick fix in the present moment then who cares about the future right? Wrong, listen to those people out there that are concerned about humanity. All those Al Gores and Jimmy Carters really have something important to say, despite what Fox News’ unfair and unbalanced views are. But with the end result whatever it may be, at least there is still hope right now. Although you declare sculpting as your primary medium, you also occasionally paint and draw – are there any other yet unconquered spheres of art you wish to dive into? Yes! I want to make movies too! I have a whole arrangement for a movie in my mind and it involves surreal dark humor as a musical. And these are the characters: a talking dog is the narrator who speaks very slowly with a deep voice, an obese truck driver dressed in overalls and his petite beautiful lover, who sing a duet in a lovely grass meadow. A construction worker dressed in an orange work uniform and hard hat who sings about his job with with ferrets in his hand. So something like a Beck video gone to extremes. And lots of other completely unrelated stuff that I have yet to bring together in an epic movie script. Are there any artists that deserve more attention that the public gives them at the moment? I know certain artists who have too much attention! Seriously though, I think there are many overlooked artists who contribute to this world beyond the merit and value of money and marketability. These are a few I feel strongly about but these folks already have big followings: Pat Rocha, Silvia Ji, Tiffany Bozic, Andrew Gonzales to name a few. What an amazing interview, coupled with some of the most intricate and beautiful art I have ever set eyes on. I wish more people thought the way Kris did.. 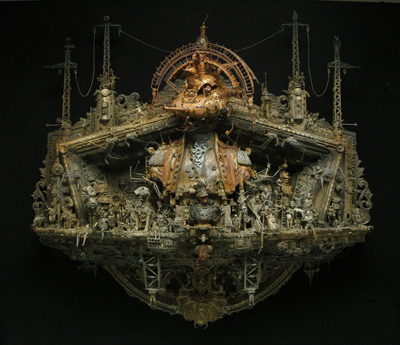 The intricacy of his art reminds me of Sedlec Ossuary. Beautiful. Thank you for sharing this multitalented artist with us. I feel he’s one of the new staple artists I will look to. His work is like Geiger in a way, and what a lovely mind as well. These statements say a lot about his work– why it’s so sublime, beautiful, terrifying. Incredible artist. I’m so glad this is up… I honestly had no idea he gave you such a wonderful, thoughtful interview. 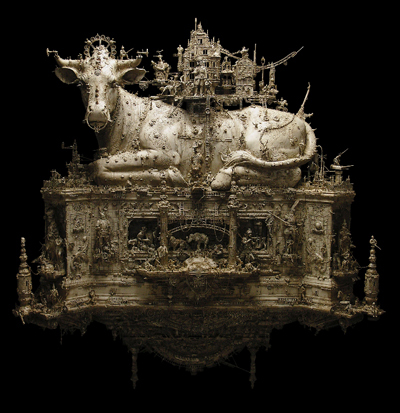 You should never miss a chance to see Kuksi’s work in person: There’s so much detail, so many little vignettes within each work. And of course its three-dimensional nature makes photographic representations of the work incomplete at best. If you’re lucky enough to see his name listed at a local gallery, by all means go. Great interview. 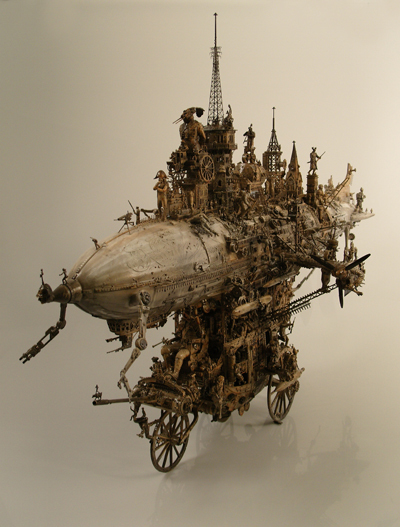 I have always wondered at the thought process behind Kuksi’s work. Thanks for the glance inside the mind of a great artist.